Wonderful; I love seeing blogger world making a difference. Another book to put on my list of Jason McIntyre reads. I've bought 3 of your books, but haven't had time to read them yet *hangs head in shame* I will though; and I'm sure I will enjoy this novella too. Ah, Donna, you're wonderful. Whether you get to reading them or not, I thank you for endlessly dropping into this site and sharing your wisdom and support. It is exciting to see tweets and Facebook mentions help to make a difference, isn't it? A year ago I might have scoffed at such an idea. Get The Night Walk Men from Amazon soon -- I have no idea when or if that site will slap a price back on it (that is, of course, if the Kindle format is your format of choice. The story is free almost everywhere else on the web). My goodness, that's a whole lot of downloads! 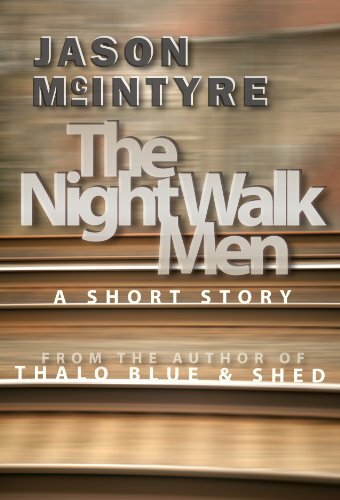 What a great treat for your readers - those who've read your work already, and those who will be introduced to it with "The Night Walk Men." Congratulations, Jason! Keep them coming! Awesome news, Jason! I hope you've gained lots of new readers for your other work. And I cannot wait to read the next installment of The Night Walk Men! Darcia, thanks, I appreciate your words. So glad you liked The Night Walk Men. Awww! Thanks, Ellie! Now if only some of those folks would read those copies they grabbed. Haha!